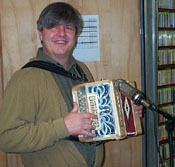 As seven-time All-Ireland Celtic button accordionist John Whelan aptly puts it, “It’s a necessary evil.” But with the help of John, WSHU Chief Engineer Paul Litwinovich and a generous challenge grant from WSHU listener Francis Braunlich of Hamden, the Profiles winter pledge drive ended up being a lot of fun. Yes, we did a bit of sweating (as always), but thanks to our loyal and new listeners we also did our part for folk and acoustic music on WSHU/WSUF. The programming for the night was a wild mix of recorded and live performance from John, selections from our “Live In WSHU’s Studio A” shows on Profiles and selections from a few albums, including the “world radio premier” of an old vinyl recording that John did at age 14 with another teen, Christine Considine, in England. And thanks to all our listeners who called and e-mailed pledges during the show.